An English professor emeritus at William Paterson University of New Jersey, Virginia Ramey Mollenkott is the author or co-author of 13 books, including several on women and religion. She is a winner of the Lambda Literary Award (in 2002) and has published numerous essays on literary topics in various scholarly journals. In the mid-1960’s as her feminist awareness grew, Mollenkott began including women’s literary achievements in her classes and guest lectures. In 1973 she spoke at the first conference of evangelical feminists at the conservative Baptist Theological Seminary (Denver) and also wrote the introduction to Paul King Jewett’s theological book Man as Male and Female. In 1975, she spoke at the first national gathering of the Evangelical Women’s Caucus in Washington, D.C., and has delivered plenary speeches at almost every gathering of the organization for the next 40 years. She retired from leadership of the Sisterly Conversations gathering held every September at Kirkridge Retreat Center because of her arthritis disability in 2013. Mollenkott is a member of NOW, the Women’s Institute for Freedom of the Press, and the Religious Coalition for Reproductive Choice. 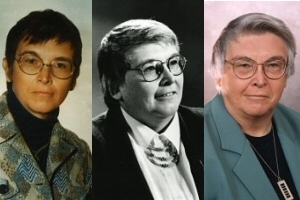 She also serves as a manuscript evaluator for the Journal of Feminist Studies in Religion; and was a member of the translation committee for the New International Version of the Bible (1970 - 1978); and of An Inclusive Language Lectionary (National Council of Churches). She is also a member of the Fellowship of Reconciliation, CLOUT... and served on the Board of Pacem in Terris. In 1978, she co-authored Is The Homosexual My Neighbor? A Positive Christian View, which was expanded and updated in 1994. She has lectured widely on lesbian, gay, and bisexual rights and has also been active in the transgender cause, serving as co-author of Transgender Journeys (2003). She recently contributed a chapter titled, "Trans-forming Feminist Christianity," to New Feminist Christianity: Many Voices, Many Views, edited by Mary Hunt and Diann Neu (2010). Mollenkott, who was married to Judith Suzannah Tilton until she passed away in 2018, has one son and three granddaughters. Virginia earned her B.A. from Bob Jones University, her M.A. from Temple University, and her Ph.D. from New York University. Virginia received a Lifetime Achievement award from SAGE, Senior Action in a Gay Environment, a direct-service and advocacy group for seniors in New York City in 1999, and the inaugural Mother Eagle Award from the Q Christian Fellowship and Christian Feminism Today in 2017.